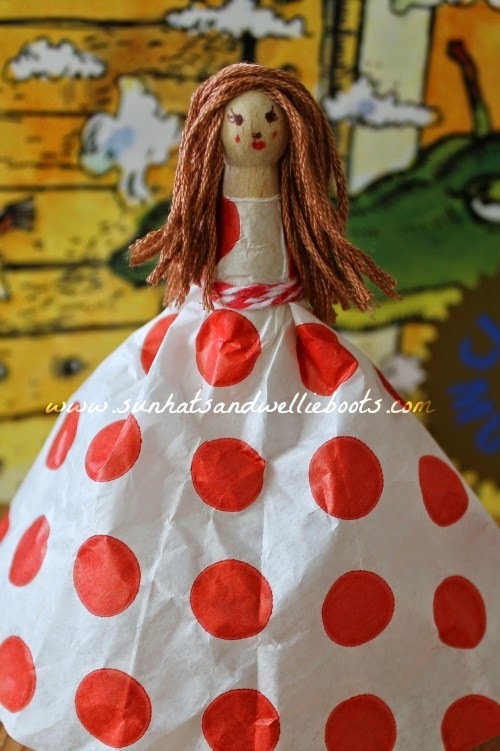 Sun Hats & Wellie Boots: The Paper Bag Princess Puppet - made from a paper bag! The Paper Bag Princess Puppet - made from a paper bag! If you're looking for a modern fairy tale with a Princess who is smart, strong & wise, then The Paper Bag Princess by Robert Munsch is an ideal picture book to start with. 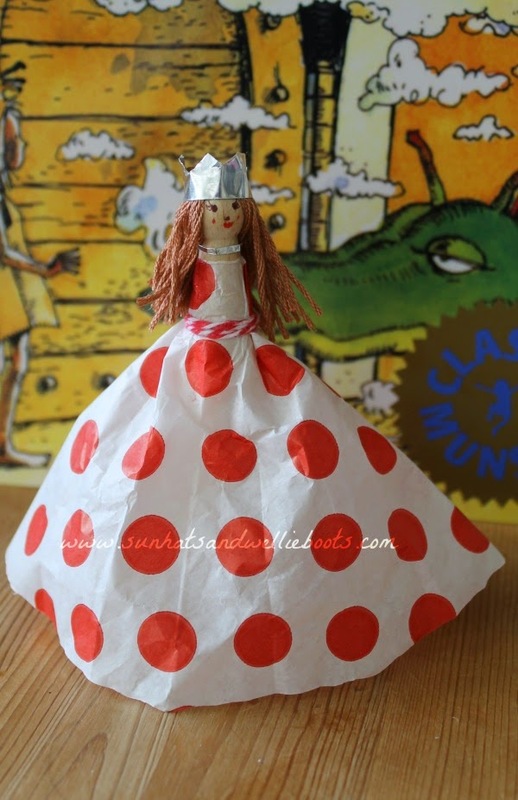 Inspired by the story we made a princess puppet from a recycled paper bag to use in our storytelling & small world play. 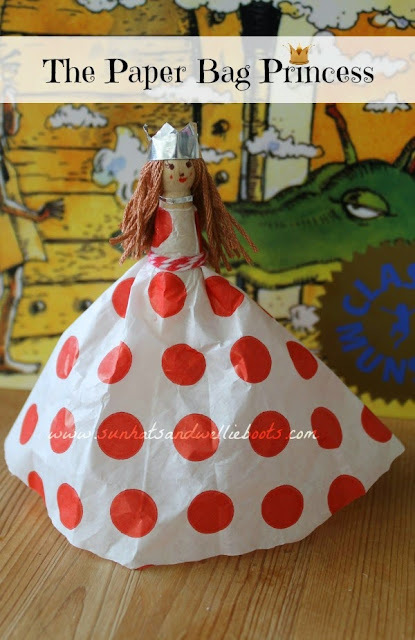 The Paper Bag Princess tells the tale of a beautiful princess who is always dressed immaculately & soon to marry her prince, that is until a dragon comes by & burns down her castle, along with everything she owns (including her clothes) & carries off her Prince. Undeterred Princess Elizabeth finds a paper bad which she uses as a dress & decides to chase the dragon & get her Prince back! When she eventually finds the dragon she uses her wisdom to outsmart him & eventually rescues her Prince! I won't spoil the story for you by telling you the ending, but it might not be what you'd expect! This is a great book with a fabulous spin on the classic fairy tale ending, & presents the Princess as the hero who is brave, strong, independent & smart! The text is bold & clear, & the colourful illustrations perfectly depict the narrative. 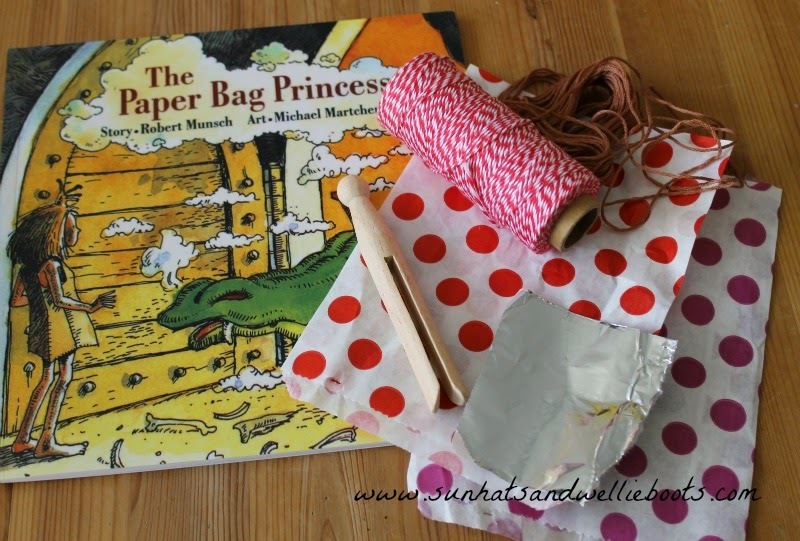 Inspired by this strong female book character we wanted to create our own paper bag Princess. 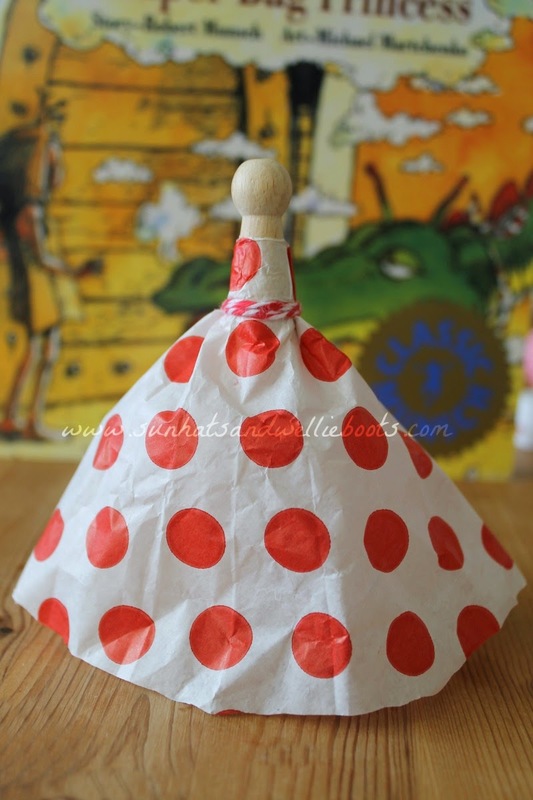 To create the paper bag dress we folded over one corner of the bag so it was level with the side & formed a point. 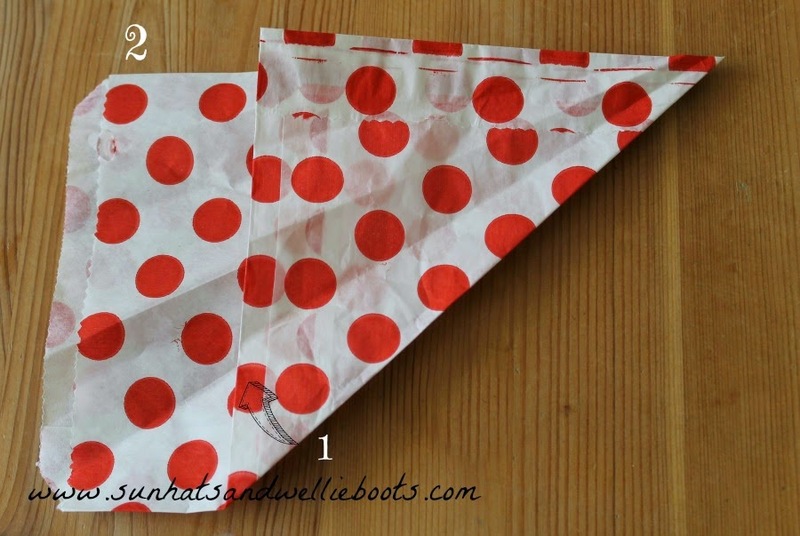 Then we folded the bag in the same way again (as in the picture below moving side 1 to side 2) & repeated a couple of times. To turn this into a dress we cut the tip off the point to create a hole that was large enough to go over the top of the peg. 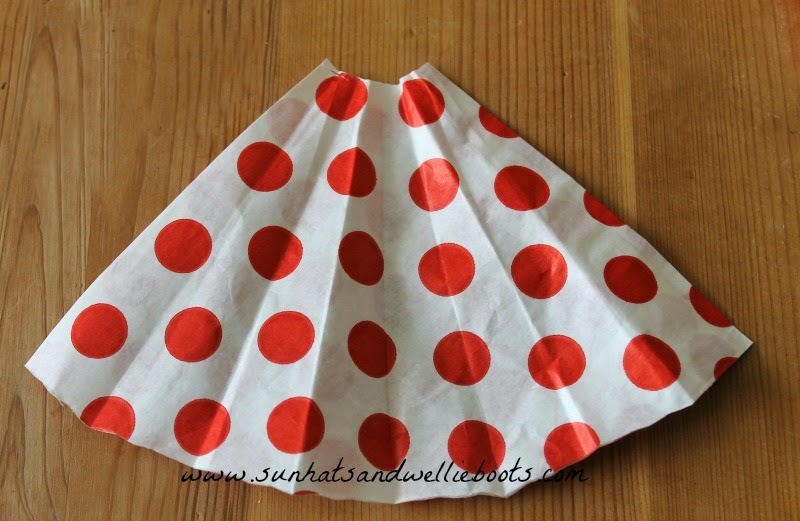 When unfolded it made a rough dress shape. To attach this to the peg we covered the middle section of the peg with glue & pushed this through the hole in the bag, carefully wrapping the paper around the middle 'body' section. The bottom of the dress can be trimmed if needed. 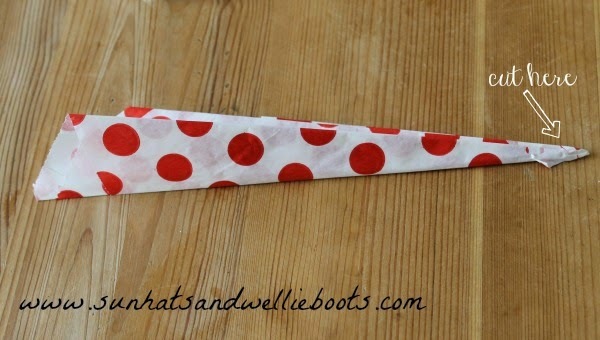 To help the paper stay in place & to create a waistband for our dress we tied a small length of string around the middle. Our puppet needed some beautiful Princess hair so to create this we cut off several lengths of embroidery floss, wool/string/felt would work too. We covered the top of the peg with glue & attached the threads. I was a little unsure whether the glue from the glue-stick would be strong enough to hold all the threads in place, but amazingly it did. To complete our Princess we added facial features using a ballpoint pen. 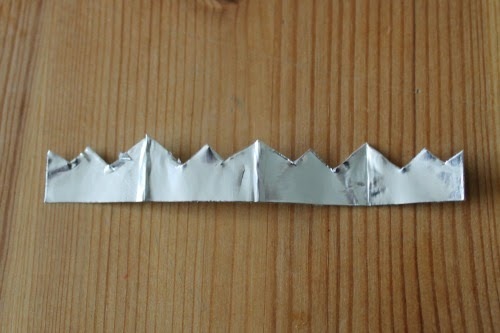 Last but not least our hero needed a crown & to make this we folded a small section of kitchen foil & cut a zig-zag edge across the top, we then opened it out & glued the ends together, trimming of any excess. We decided our Princess needed a necklace, so we added a thin strip of tin foil to create her silver jewellery. And she was ready to go & rescue anyone in need! This peg puppet is just the right size to use alongside the book when sharing the story, & would make a great addition to any fairy tale play scene, or castle! I wonder what imaginative play or storytelling she'll inspire, I can't wait to find out!